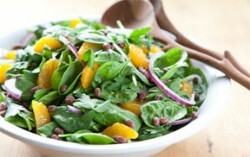 he deep, vibrant green of spinach is a welcome burst of color and crunch to the menu in spring. Bursting with nutrition, spinach offers vitamins A & C, iron, and calcium, in addition to fiber – all for very few calories per serving. A sweet tip to increase the nutrient benefits of that tasty spinach? Pair it with a vitamin C source like orange or strawberry slices, and toss with a little olive oil. These pairings not only taste delicious, but working together, offer better nutrient absorption too. Vegetables are a fantastic value for the money since they are packed with nutrients for minimal calories, fat, sodium, and of course, no cholesterol. Spinach is a great option for busy nights. Tasty raw, steamed, or added to entrees, this veggie takes just minutes to prepare! Get the kids involved early to help instill good eating habits right away! Have them wash vegetables, set the table, and even help with menu planning! In a large salad bowl, combine the spinach, mango, avocado, tomato, onion and mushrooms. Prepare the dressing in a jar by combining the oil, vinegar, pepper and sugar. Seal, shake well, and pour over salad. Toss and serve. Recipe courtesy of www.allrecipes.com. For this and other recipe ideas, visit www.jewelosco.com and click on “plan”. © 2731 Chicago Hispanic Newspaper, Lawndale News, Hispanic Bilingual Newspapers, Su Noticiero Bilingue. All rights reserved. XHTML / CSS Valid.